Find it hard to get on with, my C750-UZ gave much better results with a lot more ease. Probably down to me more than the camera - I'm sticking with it, and trying not to revert to the 750! Had this camera since the beginning of 2007. Many features for the serious photographer ate an inexpensive price. Very good battery life with rechargables. Every shot is clear unlike some of the smaller cameras. This is my first camera as well. I figured it was good to buy something around the $300 range in case.. i sucked lol. I think it has a lot of options. i love the zoom on it even tho its digital and not "optical". I think pending on the user this is a really great camera to start out with. Ive never bothered with the "manual" if you can even call it that, everything I know about my camera I taught myself. When I first was comparing cameras a few reviewers said this was the perfect first camera because its a point and shoot but still has a lot of the same options as an SLR. I dont know. I love it personally. This is my first camera as a beginner. I love it. It has a lot of great functions to learn about, and I'm getting there. Having a little problem with noise in low light, but I think I just need to adjust some settings. having a great time with it. I love this camera. 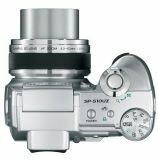 I own a Cannon Rebel XTi as my SLR, and my Olympus SP-510 as my point and shoot, could not have picked a better camera. SP-510 was a big dissappointment, sorry!